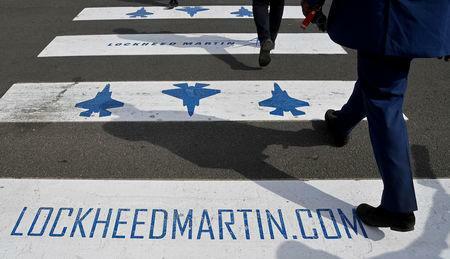 NEW DELHI (Reuters) - Lockheed Martin offered India on Wednesday a new combat jet to be made locally, the F-21, in an attempt to win a large military order worth more than $15 billion. The U.S. defence firm had previously offered its F-16 fighter used by countries around the world for the Indian air force's ongoing competition for 114 planes to be made in India. But Lockheed, unveiling the plan at an air show in the southern city of Bengaluru, said it was offering India a new plane configured for its needs. It would carry technologies from its fifth generation planes, the F-22 and the F-35, the firm said. "The F-21 is different, inside and out,” Vivek Lall, vice president of Strategy and Business Development for Lockheed Martin Aeronautics, said in a statement. The company will build the plane in collaboration with India's Tata Advanced Systems, the firm said. Lockheed is competing with Boeing's F/A-18, Saab's Gripen, Dassault Aviation’s Rafale, the Eurofighter Typhoon and a Russian aircraft for the air force order. The deal to replace the Indian Air Force's ageing fleet of Soviet-era fighter jets is one of the biggest contracts for such planes in play. India has a lengthy procurement process, and no decision is expected until well after a national election due by May. Lockheed has offered to move its F-16 production plant at Fort Worth, Texas, to India, if it wins the order in a boost for Prime Minister Narendra Modi's Make-in-India plan to build a domestic military industrial base and create jobs. It said it expected to export planes from the proposed plant in India on top of the Indian requirements for an overseas market that it estimated at $20 billion. But the Indian military has had concerns over the F-16 as an old plane and in an earlier competition it lost out to the eventual winner, the Rafale built by Dassault. But Lockheed said the F-21 could be India's pathway to the stealth F-35 fighter, which has entered U.S. service in one of the world's most expensive defence programmes. "The F-21 has common components and learning from Lockheed Martin’s 5th Generation F-22 and F-35 and will share a common supply chain on a variety of components," the company said. It said production in India would create thousands of jobs for Indian industry as well as support hundreds of U.S.-based Lockheed Martin engineering, programme management and customer support positions.